Blooming South Bohemian countryside and cars powered by energy of the future. 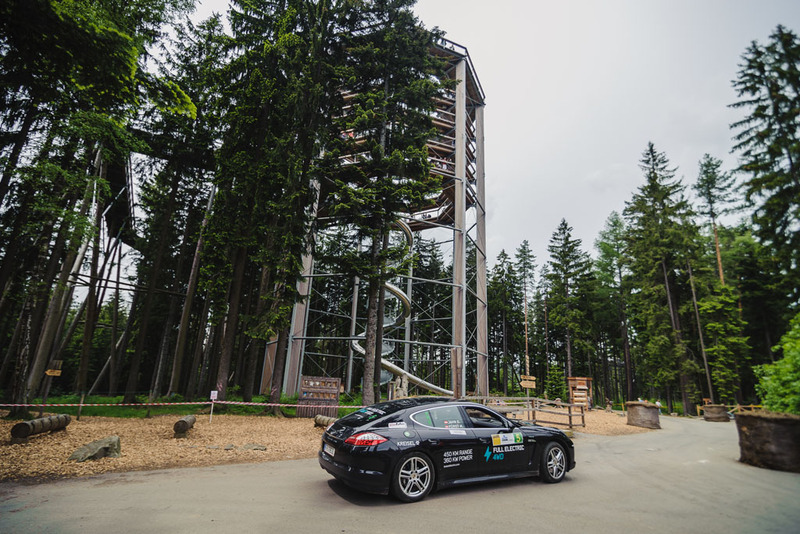 For the 6th year already, this combination attracts fans of electric and CNG cars to Český Krumlov and its vicinity. It will not be different this year. May 18 to 20 ÚAMK South Bohemia Rally Club will organize, in cooperation with the ČK motorsport team, the 6th New Energies Rallye Český Krumlov 2017, an international event included in the world series of FIA Electric and New Energy Championship. Compared to the last year‘s premiere in the World Championship, whose importance had been underlined by the presence of Jean Todt, President of FIA and a former head of F1 Ferrari team, the only regularity rally for alternative energy cars in the Czech Republic has undergone some changes. The most important one has been instigated by the fact that FIA organizes the championship only for electric cars, hybrid vehicles and hydrogen fuel cell vehicles. „Other participants, for example owners of CNG or LPG cars may of course participate as well but for them we organize a national ÚAMK Regularity Trophy that will reduce some obligations ensuing from international sporting codes. For example they do not have to leave their cars in parc fermé overnight. On the other hand, we would recommend all interested participants with an electric or hybrid car to enter the World Championship classification for the reason of prestige, as parc fermé will be also a charging point,“ explains Clerk of the Course Pavel Kacerovský, adding that the electronic entry form is available, together with information on the programme and rules, at the official website www.rallye-newenergies.cz. The timed sections will be preceded by a concentration leg, like in previous years. Crews presentation and ceremonial start will be then held simultaneously at two different places. The crews will have the chance to choose freely between Tábor where the organizing body is the local High School for Engineering and Construction (Střední průmyslová škola strojní a stavební), and the Upper Austrian town of Rainbach im Mühlkreis, not far from Freistadt. For the company Kreisel Electric dealing with battery systems and rebuilding traditional cars to electric vehicles, the New Energies Rallye will be a good occasion for a grand opening of its brand new modern seat 3KOne. After the Thursday‘s administrative checks and scrutineering in the beautiful environment of the Brewery Garden (Pivovarská zahrada) in Český Krumlov, the opening gala evening in the five-star Hotel Růže will follow. In the following two days, competitors will be comparing who is able to most precisely maintain the average speed set by the organizers for the demanding regularity tests. „We have paid close attention to the route planning. Not only do we wish to test the ability of cooperation between a driver and co-driver through hidden timing photocells, but also driving abilities and a good sense of direction will be important. For the crews we have prepared more than a double length of stages compared to the previous year, running on the tracks of present or former special stages of Rallye Český Krumlov. During Friday and Saturday the crews will cover over 300 km altogether, over half of the distance will be measured precisely to a tenth of a second. All participants may look forward to visiting places where the top drivers with real race cars will fight for the best positions. As every year, the unforgettable experience will be passing the special test at the Exhibition Grounds (Výstaviště) in České Budějovice that is scheduled shortly before the „big“ rally starts and the track is packed with spectators,“ offers the Clerk of the Course of the 6th New Energies Rallye Český Krumlov 2017 a look into the roadbook.